A 2-3 vote failed to bring the “Franken-tax” back to life, even though voters approved it with a successful ballot initiative seven years ago. After it first passed, a bribery scandal effectively tainted efforts to put the tax hike into effect. But today, public safety budgets, particularly the sheriff’s department, have eroded significantly since that time. The proposed ordinance had already been brought before commissioners once this summer. A lack of a spending plan then, however, forced the item to be tabled. In fact, Sheriff Tony DeMeo and Pahrump Valley Fire Chief Scott Lewis hadn’t even been consulted on how their departments would use any new revenues generated by the half-cent sales tax. At Tuesday’s public hearing, few got up in support of the measure. In fact, most board members, including Dan Schinhofen, who put the measure on the agenda in the first place, have a history of not supporting the tax hike. Schinhofen said he remembered voting against the ballot initiative in 2006 as a voter, but said during his original campaign for commissioner that he would support voters’ decision. Commissioner Lorinda Wichman recalled during the hearing that she in fact was a government affairs representative for Round Mountain Gold when the tax hike was passed. She went before commissioners then and argued against the tax because it would have cost her employer, which was in the midst of moving its crusher plant, an additional $300,000. She seconded the motion to pass it Tuesday. “It is strange that I find myself in the position now of seconding this motion because how vehement I was about it when it came up the first time. So, just in an effort to let you all know how things can swing and you can come full circle, the reason I have seconded this is because it is the will of the voters,” she said. At one point Commissioner Frank Carbone suggested he may be willing to support the hike if it were tabled again, as Commissioner Donna Cox also suggested. 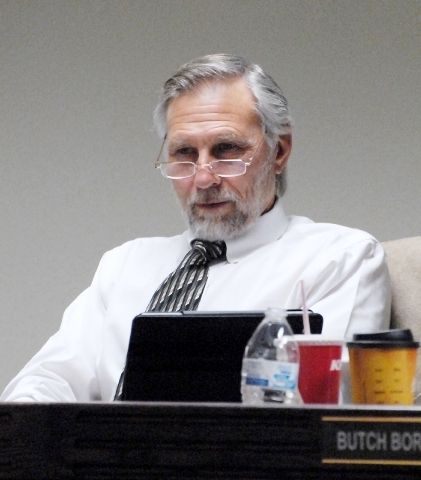 Commission Chairman Butch Borasky admitted during the hearing that it was a tough vote. “This is going to be a tough one for me because I supported it before,” he said, before launching into a comparison of the tax vote in 2006 and the vote last year to disband the Pahrump Town Board — which suggested that although he was against the tax, he would support the voters’ final decision. Borasky called for a roll call vote after his comments. Schinhofen voted yea. Carbone then inexplicably attempted to abstain from the vote altogether. “It’s a hard decision,” he said before a long pause. Cox voted nay after some laughter over Carbone’s attempt to avoid the difficult vote — one official later said the commissioner, with more experience, will learn to simply excuse himself for a long bathroom break during tough votes as his predecessor mastered. Wichman supported the motion but Borasky, far from supporting the will of the people, joined Cox and Carbone and cast a nay vote, which sent the tax hike to its final resting place. The only way the tax could reemerge is if a new ordinance is crafted, public hearings held and a new vote taken at some later date, Schinhofen noted. Meanwhile, the sheriff’s department is losing its third-ranking commander in just more than a week and will not be able to hire another employee to fill the slot left over should someone be promoted. The department is already down 45 employees since at least 2006. And the sheriff’s budget has dropped from $16 million annually to $12 million in that same time period. The department has also overrun its budget consistently for the last several years. A visibly upset DeMeo asked for a comment just after the vote, expressing his dismay with an expletive, before saying he would provide a fuller response later. “It was shock and awe. I couldn’t believe it. Our crime rate is up 44 percent. Our population increased 2,000 people and I don’t have the manpower,” he said. Lewis said he was shocked by the vote, too. “We will continue to provide the best service we can with the resources we have,” he said. Later, one source said Carbone and Borasky were pressured into voting no by local Republican Party leaders. Indeed, Bill Carns, chairman of the Nye County Republican Central Committee, spoke during the hearing against the tax hike. Citing the GOP’s local, state and national platform of low taxes and small government, Carns beseeched the commission to nix the tax hike, though he himself is a former police officer and said he understands the budget problems affecting the sheriff’s department. He told commissioners that they should put the issue back before voters. “I am not for increasing taxes. But I also do understand there are concerns to providing these services, especially within the command structure and within the new jail. I’m not saying I’m sold on it. I think it would be appropriate for the sheriff’s department and the various fire services throughout the community to put that information forth financially to how this would benefit the communities. I believe the most prudent way to do that is to put it on the general election ballot,” he said.